Lemon Drop: Loving Britain Giveaway Winner ! Loving Britain Giveaway Winner ! Thank you to all my followers for your participation in this giveaway. 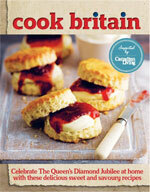 I am excited to share with you all today the name of the winner of this great British cookbook. The winner is: Ellen - who blogs at Bake It With Booze! Congrats, Ellen ! You will definitely enjoy trying all the amazing sweet and savory recipes in this gorgeous cookbook. Please email me your shipping address as soon as possible so I can mail off your prize. Textual content and digital images appearing on Lemon Drop are Protected by Permanent Canadian Copyright. Unauthorized use and/or duplication of this material without express and written permission from this blog’s author and/or owner is strictly prohibited. Excerpts and links may be used, provided that full and clear credit is given to Linda and Lemon Drop with appropriate and specific direction to the original content.